The Winter Olympics are still on and Canada is doing so well. It makes me feel like cooking! And cooking is something I have been doing…. and in my house, when you cook – you pair it with wine. 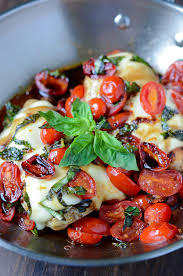 I have posted a recipe for Caprese Chicken before, but this is my own twist to the recipe. So, I am calling this one my own… and it tastes as good as it looks. Cook your chicken breast. In a small frying pan combine the olive oil, balsamic vinegar, onion flakes, garlic, mozzarella cheese, the baby plum tomatoes and salt and pepper. Sautee for a couple of minutes and pour on top of the chicken and garnish with the basil and parsley. Guaranteed to wow family and friends. Now for the wine! Here’s a match made in Valentine’s Day heaven. Kim Crawford Pinot Noir out of New Zealand. From the cooler regions of New Zealand, this Pinot Noir is flavorful and food friendly. Earthy tones with fruity black cherries and raspberries this wine would compliment, and not compete with all the flavors in the Caprese chicken. I decided to have a little fun with my original Caprese chicken recipe, and this is the wine I matched with it. Drinking white with this dish? You can’t go wrong with most of the Chardonnay’s out of California. This one is from Dreaming Tree, getting a lot of good reviews about its Chardonnay, and the winery as a whole, co-owned by musician Dave Matthews. Beautiful citrus notes, apples and some spice, this is another great wine that won’t compete with the flavors of the dish, but will go hand in hand. 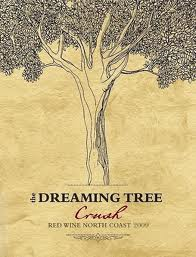 I have a friend at work, Cassandra who loves the Dreaming Tree Red Crush. This would go with the Caprese Chicken as well. The Red Crush contains some of my favorite grapes in the whole world, 55% Merlot, which gives it those gorgeous smoky berry plum flavors, and rounded out with Zinfandel, Petite Sirah and Syrah. Fruity, smooth but with great structure from the Syrah, this wine can stand up to just about any dish. For those that have never hear of Petite Sirah, it’s a different grape variety from Syrah, which is also known as Shiraz. Petite Sirah orginiated in France, as a clone with Syrah as the Daddy plant and Peloursin as the Momma plant. Petite Sirah is late to ripen, so it didn’t do well in France. It thrives well in California, where you will see many wine makers include it in a blend to add a deeper color, more distinct tannins and a velvety texture. I had my sister over for supper this past week. She takes care of my Tigger when I travel. And she loves my stuffed Butterfly pork chops. So here’s the recipe. Thanks to my friend Jay Lawrence for passing along what has become one of my favorite recipes. Make stuff and put the stuffing on one side of the pork chop. Fold over and secure with tooth picks. I like to grill them, but you can do them in the oven. I like to serve them two ways, one with a spicy mustard, or a curried pickled relish. Riesling…. Even if you are not a white wine drinker, try this delicious Riesling from Germany. Even if you have tried a Riesling and didn’t like, spend the couple of extra dollars and try this one. The Balthasar Ress Hattenheim Riesling from Rheingau. Now there’s a mouthful. You may want to take a picture or write that one down before you head out to your favorite wine store. This premium German Riesling has a touch of sweetness, great acidity and mouth-watering flavors of apples, pear and honey. Hello! What’s not to like. It will be like a sweet kiss with this sweet pork dish. If you just drink red, a nice smoky Merlot. And because I like Merlot so much, I’m going to recommend a couple of my favorites. One of the best deals in the liquor store right now is DaDa out of Argentina. At under $16, this fabulous juicy plump Merlot is full-bodied and made with no sulphur additions. Gorgeous Merlot. I always have a bottle or two in the wine rack. Another gorgeous Merlot is this Benziger from Sonoma County in the Napa Valley. Not to be confused with the Beringer Family, although they make really good wine too. This is a nice rich plummy wine with a hint of vanilla from the oak aging. Another good deal is this Merlot-dominant Bordeaux out of France. 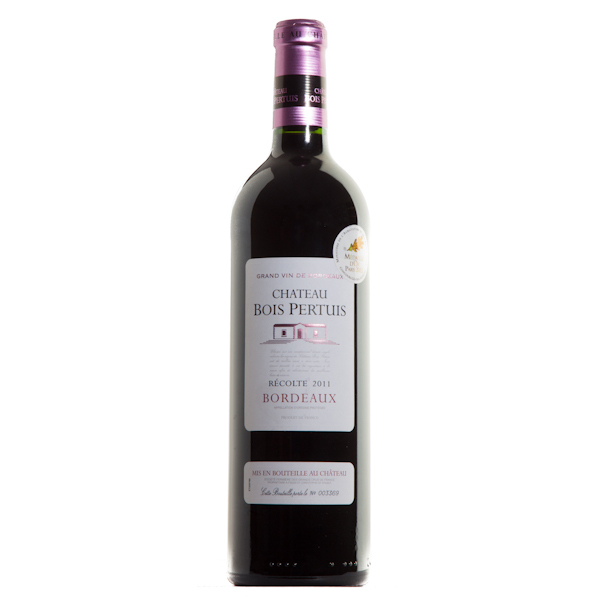 Under $17, and this Bordeaux will surprise you. Of course being Bordeaux, it’s a blend, there’s some Cabernet Sauvignon and Cabernet Franc in there as well. Oh, and since the Olympics are on, this wine won a Gold and Silver Medal in competition. Medium bodied with plum and cherry flavors, a hint of vanilla and its been aged in French oak for 8 months. To use expensive French oak (each barrel ranges from $800 to $1200) and sell the wine for under $20, that’s a good bargain. And its very food friendly. This entry was posted on February 15, 2014 at 4:58 pm and is filed under Uncategorized. You can follow any responses to this entry through the RSS 2.0 feed. You can leave a response, or trackback from your own site.